The kids went back to school this week! Celebrate by checking out the Lafayette Peach Festival, the Rocky Mountain Folks Festival or any of the fun events below. All happening this weekend in and around Boulder. Update: the Boulder Gelato Festival has been cancelled. Lafayette’s 19th Annual Peach Festival centers around world famous all natural Palisade, Colorado peaches. Enjoy peach pies, peach cobbler and peach smoothies. Food vendors, crafters, antique dealers along with some of the finest artists from the Front Range and Western States will be showcased. Children’s activities, live entertainment and music throughout the day. Over 30,000 pounds of Certified Organic Peaches from Morton’s Orchard’s, Tate Orchards and Red Fox Run Orchards in Palisade, CO. will be available in 4 locations along Public Rd. Free face painting by Face Fiesta & balloon sculpting all day, 9:00am-4:00pm! Bonfils Bloodmobile will be holding a Blood Drive from 9:30am – 3:30pm. Look for the Bonfils Bus on S. Public road near Kimbark Street. The Lafayette Peach Festival will be held in Old Town Lafayette on Public Road. The event is FREE. Citywide Banks on Coalton Road is hosting the annual FREE community carnival! Kids will love bounce houses, a petting zoo, princesses & pirates, face painting, photo booths, fire engine tours, food and more! Free to the public. Citywide Banks is located at 2002 East Coalton Road, Louisville, CO 80027. The event is FREE. Join the Firehouse Art Center and ArtWalk Longmont for the first annual Canvas Carnival, with 5+ working artists, food vendors, games and activities for the whole family at Grossen Bart Brewery in Longmont, CO. Face painting, interactive art activities, music, beer and more! The Canvas Carnival will be held at Großen Bart Brewery, 1025 Delaware Ave, Longmont, CO 80501. $5.00 suggested donation at the door. Erie’s Concerts in the Park will be hosting two concerts in July! On August 18, local Erie bands will perform including Case in Point, Bakersfield, 50 Shades of Blue and Down2Earth. FREE children’s activities. Beer, wine and concessions will be sold. Erie Concerts in the Park is held at Coal Creek Park, 575 Kattell St, Erie, CO 80516. The concert runs from 5PM – 8PM. Admission is FREE. All Dogs are invited to bring their owners along to Boulder’s doggy social event of the year at Bark in the Park! This free event is also a fundraiser for the Humane Society of Boulder Valley. Bark in the Park will feature a fun social gathering for dogs and their owners. At the event you will find a vast array of pet services and product from pet related exhibitors mixed in with outstanding arts, crafts and merchandise at the Boulder Market. There will also be a variety of fun dog activities and competitions along with a pet parade and great live music. Bark at the Park will be held at Central Park, 1236 Canyon Blvd, Boulder, CO 80302. The event is FREE. Spend a glorious Colorado summer weekend celebrating songs and stories from around the musical and geographic world along the St. Vrain River at the 28th Rocky Mountain Folks Festival at Lyon’s magical Planet Bluegrass Ranch. The “summit on the song” welcomes our favorite songwriters from folk, rock, country, indie and more including Regina Spektor, Indigo Girls, Jeff Tweedy, Los Lobos, The Milk Carton Kids, Tinariwen, and many more! Full lineup can be found here. Numerous camping options nearby include: on-site at the festival grounds, along the St. Vrain at the new River Bend Campground (across the street from the Ranch), or under the cliffs at Meadow Park (an easy five-minute walk to the festival). 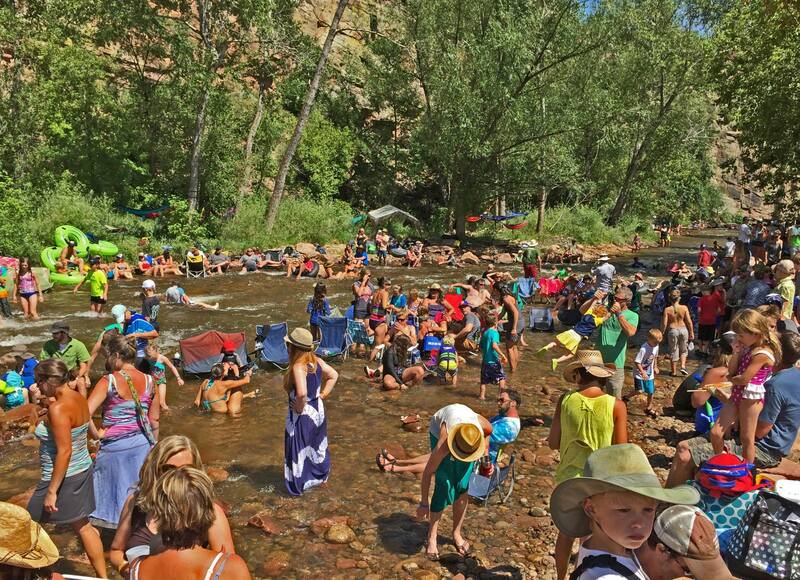 This family-friendly festival is FREE for kids under 12, with a whole host of activities: Tube the St. Vrain River through Planet Bluegrass. Paint, sculpt and assemble in the arts & crafts tent. Build sand castles on the beach. Join the variety of fun, planet-minded activities throughout the day including slacklining, tree climbing, nature studies, a kids music performance, an instrument petting zoo, and much more. The Rocky Mountain Folks Festival is held at Planet Bluegrass, 500 W Main St, Lyons, Colorado 80540. Tickets are $70+, tickets available here. FREE for kids under 12. The mission of Gelato Festival America is to spread the culture of Artisan Italian Gelato. Born in Florence, Italy, Gelato Festival is an all-star line up where the biggest names in Gelato making compete against one another with a one-time flavor they have created just for the festival. The event gives visitors the opportunity to experience the secrets of high-quality gelato, learn about the production techniques by watching the Artisans at work in the ‘laboratory’, and taste all the competing flavors, voting for their favorite one. The Gelato School is where show cooking demonstrations revolving around the world of gelato take place as well as fun activities for both adults and kids. After four events in 2017, Gelato Festival returns to the US with eight festivals all around the Country: Jersey City, Boulder, Chicago, Washington DC, Los Angeles, Dallas, Scottsdale and Tucson. Artisans and chefs will go through a rigorous selection process in order to compete in one of these eight stages. with a unique, one-time flavor specially created for the Gelato Festival. THE FESTIVAL HAS BEEN CANCELLED. The Boulder Gelato Festival is held at Twenty Ninth Street, 1710 29th St, Boulder, CO 80301. Tickets are $25-$30 Adults, $20 – $25/Children 12 & Under, FREE for kids under 2. Tickets available here.